It has been part of my own practice to take this advice to heart. I have also found sheer enjoyment in color itself through this process. Most times, I retain these color studies in order to use them as a tool in making comparisons to actual setups in the studio. One possible experiment – take a chord and mix the triad in such a way as to emphasize one color over another and therefore transform the appearance of the chord- taking into account the quality of the light for a particular subject. This is a practical reason to experiment. But there are also times where I mix in order to discover something I have yet to visualize or have an immediate use for. It is these moments that one opens oneself up to being surprised. 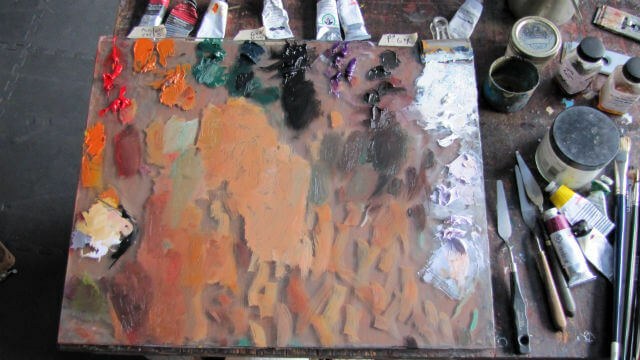 Through the process of mixing paint on the palette, observing colors in various combinations and juxtapositions, one is taken to a place where the imagination is given perfect freedom . At times these color studies prompt the imagination to discover new possibilities of color but also of images or compositions. I remember one day when I was looking through Henri’s archive, I found several pages of mock color studies. Most appeared as simple landscape compositions- sunset, beach and sea, hills and mountains, desert. I do not know if Henri had a subject in mind or whether he was planning an excursion. It was not obvious nor were there any notes accompanying these except color notes. And I felt this, in fact, was his reasoning- that they were experiments for the sake of sheer experimentation. In a sense, he allowed himself the freedom to dream in the very act of mixing on the palette, allowing images to come before his mind in the moment. And in many ways, I preferred his wonderful enjoyment of color for its own sake, having a child-like spirit as a part of his personal approach to painting. I have read that Carl Jung, in the last years of his life, spent his time engaged with moving rocks on the beach outside of his place of weekend refuge- playing like a child in the sand and allowing his soul perfect freedom to manifest through his mind’s eye those figures or images that sought to present themselves. These images he later incorporated into the architecture of his house creating a connection between his inner world and the reality of that particular place. As part of my practice, I will take, for example, a new chord and create mock compositions, trying the colors in different juxtapositions as well as experimenting with the priority of the colors-testing the focal color against several possible background colors and finding what appears to be most effective or speaks to me on some level. Sometimes within these studies, I will see a figure emerging or a possibility for a still-life composition. It is a little like the psychology of the “ink spot”. But I feel it is important to allow one’s self the freedom to, in a sense, “not accomplish” something but allow the imagination to act as a guide. This type of work, where some practical exercise leads one’s imagination into a reverie, has been described by Ibn Arabi as an isthmus- a bridge or path to the world of images. And it is in this space that one becomes connected to the deeper meaning of one’s work. The ego is let go and the more intuitive part of ourselves takes over and what we cannot “will” presents itself to us. This state of openness presents the artist with a vision of himself and his work. But it also creates within the artist a more intuitive connection to the larger forces that are active in the world. Great advice for practicing and an approach to practice. Thanks.